Whenever Nicasio Reservoir overflows at the end of a dry spell, I typically climb the cliff above the spillway to shoot a photo. It’s a difficult climb on unstable rock with only scattered Scotch broom for handholds much of the way. Today I did it for the fourth time and as usual got scratched up, but the view from a ledge high above the spillway made it all worthwhile. 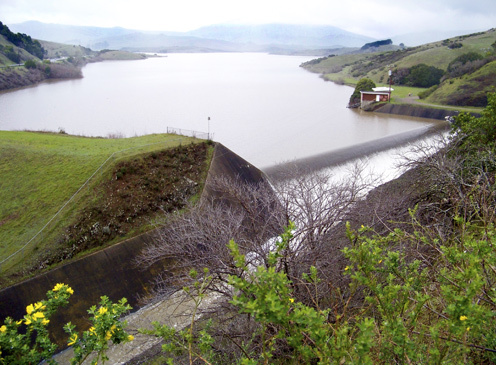 Nicasio Reservoir officially overflowed at 11:30 a.m. Sunday, Libby Pischel, spokeswoman for Marin Municipal Water District, told me this afternoon. However, another 24 hours went by before the spill became substantial, nearby resident Chuck Gompertz of Nicasio later told me. 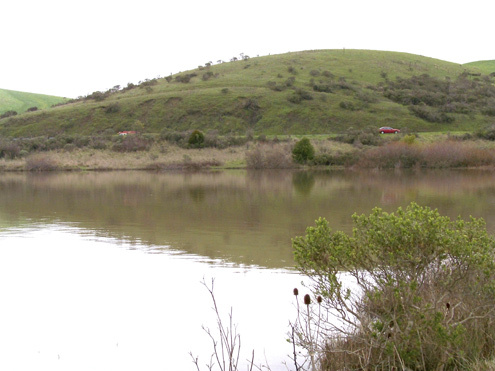 The reservoir is owned by MMWD, which serves the San Geronimo Valley and most of East Marin south of Novato. Pischel said six of MMWD’s seven reservoirs — Alpine, Bon Tempe, Lagunitas, Nicasio, Phoenix, and Soulajule — are now overflowing. As of Sunday, MMWD’s total storage was at 82 percent of capacity compared with 54 percent at this time last year and and 79 percent in an average year. 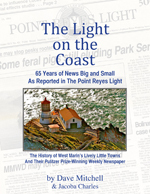 Another 1.54 inches of rain fell on Point Reyes Station Monday, Weather Underground reported, and by noon Tuesday, 0.26 inches more had fallen. In dry weather, Point Reyes Station, Olema, and Inverness Park depend almost entirely on releases from Kent Reservoir for their water. The releases flow down Papermill/Lagunitas Creek past Point Reyes Station, where North Marin Water District uses creekside wells to withdraw water for the three towns. 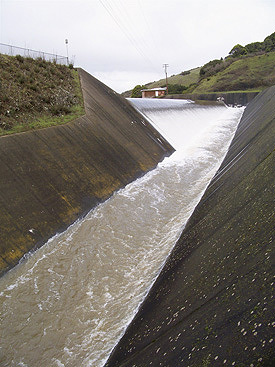 North Marin is based in Novato, and it compensates MMWD for a portion of the releases by providing MMWD with water from Novato’s primary source — Lake Sonoma in Sonoma County. On Tuesday morning, Lake Sonoma reached capacity for the first time in four years. 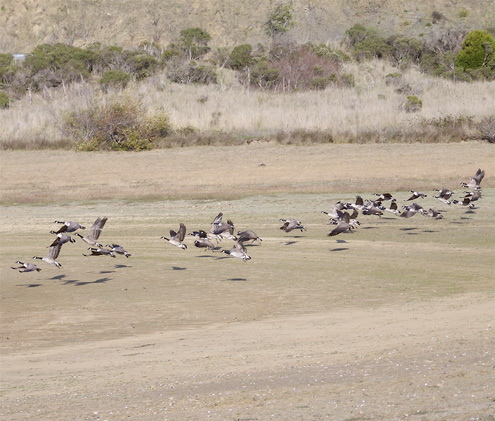 Before: Canada geese take flight from a dry cove on the east side of Nicasio Reservoir last November. After: The same cove sans geese as it looked today. With weathermen now saying there’s a chance of rain on Friday, Saturday, and Monday, MMWD’s Pischel today was looking forward to Kent Reservoir’s rising even closer to capacity, which is 32,895 acre-feet (10.7 billion gallons). The oldest reservoir in MMWD’s system is Lagunitas built in 1872. It now provides only o.4 percent of the total capacity. Phoenix Reservoir was built in 1905 (now 0.5 percent of total capacity); Alpine in 1918 (11.2 percent); Bon Tempe in 1948 (5.1 percent); Kent in 1953 (41.3 percent); Nicasio in 1960 (28.2 percent); and Soulajule in 1979 (13.3 percent). In other weather-related news, The Marin Independent Journal reported a rock slide just south of Stinson Beach closed Highway 1 in both directions for three hours this morning. Sparsely Sage and Timely is powered by	WordPress 4.9.10 and delivered to you in 0.495 seconds using 54 queries.